South African vocalist/guitarist Dave Matthews formed the Dave Matthews Band in Virginia in the early ’90s. Featuring Matthews, Stefan Lessard, Leroi Moore, Boyd Tinsley, and Carter Beauford, the group’s music presents a more pop-oriented version of the Grateful Dead crossed with the worldbeat explorations of Paul Simon and Sting. The band built up a strong word-of-mouth following in the early ’90s by touring the country constantly, concentrating on college campuses. In addition to amassing a sizable following, their self-released album Remember Two Things sold well for an independent release; soon, they were attracting the attention of majors. 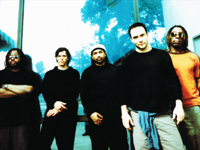 Signing with RCA, the Dave Matthews Band released their major-label debut, Under the Table and Dreaming, in the fall of 1994. By spring of 1995, the record had launched the hit single “What Would You Say” and sold over a million copies. A year and a half after the release of Under the Table and Dreaming, the record had sold over four million copies in the U.S. alone. In April of 1996, the Dave Matthews Band released Crash, which entered the charts at number two and quickly went platinum. Throughout 1996, the group toured behind Crash, sending it to double-platinum status. Also in 1996, Matthews launched an attack on bootleggers in conjunction with the Federal Government, targeting stores that were selling semi-legal discs of live performances. The efforts of Matthews, his band, and his management resulted in an unprecedented crackdown on bootleggers in early 1997 — with nearly all of the major foreign bootlegging companies placed under arrest by the United States — thereby putting a moratorium on the entire underground industry. To further combat the bootleggers, Dave Matthews released an official double-disc live album, Live at Red Rocks 8.15.95, in the fall of 1997. It was an unexpected success, debuting at number three on the charts and selling a million copies within the first five months of its release. The live record paved the way for the April 1998 release of Before These Crowded Streets, the group’s most ambitious album to date. Another live effort, Listener Supported, followed a year later. Summer tours also packed the late ’90s, with sold-out shows across the U.S. The new millennium, however, saw the band back in the studio with Glen Ballard to record its fourth studio album — Everyday, issued in February 2001. Although popular, it was overshadowed by rumors of a darker album recorded with Steve Lillywhite in 2000 but ultimately rejected; the band eventually chose songs from the session, did some re-recording of others, and released the results in July 2002 as Busted Stuff. Its debut single, “Where Are You Going,” was also featured on the soundtrack to the Adam Sandler flick Mr. Deeds.